Artist's concept of the potentially habitable planet candidate Tau Ceti f, which is found just 11.9 light-years from Earth. The odds of finding alien life in our solar system's backyard have just taken a bit of a hit. The star Tau Ceti, which lies just 11.9 light-years from Earth, is thought to host five exoplanets, two of which have been posited to lie in the "habitable zone" — that just-right range of distances that could support the existence of liquid water on the planets' surfaces. 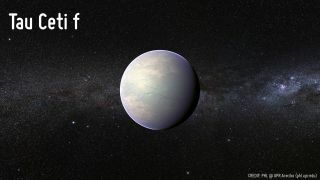 Artist's concept of the potentially habitable planet candidate Tau Ceti e, which was detected in December 2012 and lies 11.9 light-years from Earth. The possible planet is likely least 4.3 times as massive as Earth. "Planet e is in the habitable zone only if we make very generous assumptions," lead author Michael Pagano, of Arizona State University (ASU), said in a statement. "Planet f initially looks more promising, but modeling the evolution of the star makes it seem probable that it has only moved into the habitable zone recently, as Tau Ceti has gotten more luminous over the course of its life." Tau Ceti f has likely resided in the habitable zone for much less than 1 billion years, researchers said. So even if the planet currently supports life as we know it, astronomers may have a hard time finding any signs of life in the world's atmosphere. After all, it probably took about 2 billion years for detectable "biosignatures" to build up in Earth's air after the first organisms evolved, study team members said. The other three Tau Ceti planet candidates (b, c and d) all orbit considerably closer to the star than do e and f, making them likely too hot to harbor life. All five Tau Ceti worlds are likely larger than Earth. Planets e and f are estimated to be 4.3 and 6.6 times more massive than Earth, respectively; the other three worlds appear to harbor between 2 and 4 Earth masses. The new study, which was published in The Astrophysical Journal, also notes that the star Tau Ceti has much more magnesium compared to silicon than the sun does. As a result, the Tau Ceti worlds could be quite different from Earth in key ways that are not just related to size. With such a high magnesium-to-silicon ratio, "it is possible that the mineralogical makeup of planets around Tau Ceti could be significantly different from that of Earth," said mineral physicist Sang-Heon Shim, also of ASU. "Tau Ceti's planets could very well be dominated by the mineral olivine at shallow parts of the mantle and have lower mantles dominated by ferropericlase." Since ferropericlase is not very viscous, the rock within the mantles of Tau Ceti worlds may flow more easily than mantle rock does on Earth, researchers said. This could have potentially large impacts on volcanism and plate tectonics, the scientists added. "Tau Ceti has been a popular destination for science-fiction writers and everyone's imagination as somewhere there could possibly be life," Pagano said. "But even though life around Tau Ceti may be unlikely, it should not be seen as a letdown, but should invigorate our minds to consider what exotic planets likely orbit the star, and the new and unusual planets that may exist in this vast universe." The Tau Ceti candidate planets aren't the closest extrasolar worlds to Earth. In 2012, astronomers announced the existence of Alpha Centauri Bb, an Earth-size, scorching-hot planet that lies just 4.3 light-years away, in the nearest star system to Earth's own.